I'm so happy that it's Friday you guys! I was afraid this week would drag by, but surprisingly, it went by unbelievably fast for me. I think my regular yoga practice is the reason for that! Now that my Lasik surgery is completely done (and I'm glasses free), I was able to start practicing yoga again regularly this week. If we're being honest, I always thought morning workouts would be the best time for me to work out. I'm a morning person, so morning workouts should naturally be my thing, right? Wrong. After trying a few morning yoga sessions and discovering that is NOT my most flexible and/or most awake time of day, I started going to class right after work (literally, from work to class). By doing so, I really don't have an excuse to not go - my bags are packed and there's a class right as I'm finishing up with work. Not to mention, I feel I'm at my most flexible and most alert right after work. And going home and relaxing all night long after a hard workout isn't bad either! Practicing yoga 5-6 times a week (my current goal) requires some serious gear and commitment. Don't be fooled by the whole barefoot on a mat thing - if there's one thing I've learned from yoga, it's that having the right gear can make all the difference. 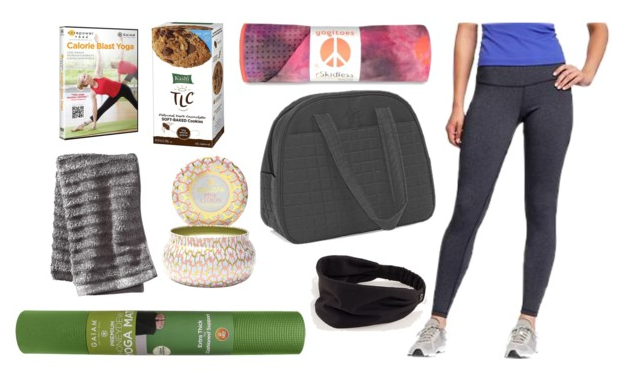 I didn't purchase all of my yoga gear at once (thank goodness, otherwise this girl would be broke), but over time, I have accumulated my favorites. While some pieces are expensive, most are actually really affordable. Yet another reason I love yoga! First and foremost, your mat. I'm currently using the Honeydew Mat by Gaiam (you can purchase this at Target). It's thicker, which I appreciate, especially for inversions. Plus, I scored mine for around $30. I'll need to upgrade eventually, but for my daily studio use, this thing is perfect. I do hot yoga at Corepower Yoga, so my second most important staple is my towel mat. The Yogitoes Skidless Mat is honestly a gift from heaven, I'm sure of it. It clings to my mat and gives me extra grip, even when things get sweaty (TMI?). While they aren't the cheapest things to buy, they're worth the investment in my opinion, and are easily washable. A huge bonus! For my gym bag, I chose a Gaiam bag from Target. Super simple, inexpensive and holds everything I need it to. Plus, it has bungee straps on the bottom as a holder for your mat. I bought this bag on impulse before I was really into yoga, but I'm glad I did! A few things I always carry in my bag are a towel (textured towels from Target are my favorite), a snack (I'm a sucker for Kashi products, especially if they're made with chocolate), and my Lululemon Bang Buster Headband. That thing is my life saver in hot yoga classes! When it comes to yoga clothes, it's easy to fall in love with Lululemon gear (hello, everything is so cute!) But the majority of my yoga investment goes toward my membership at Corepower, so lately I've been working to find quality yoga gear at affordable prices elsewhere. Let me tell you, I've been pleasantly surprised! My all-time favorite yoga pants (see below) are compression pants from Old Navy, and are a STEAL at less than $30. I'm still on the hunt for a few affordable tops, and I'll post links when I do! While these are just a few of my favorites, I'd love to hear yours! What do you recommend?